You are here: Home / Furniture Makeovers / Chairs / How to Reupholster a Wingback Chair: Step-by-Step Video Tutorials! I did something scary last year: I decided I was going to learn how to reupholster a wingback chair that I had bought at the thrift store. First of all, I don’t typically buy upholstered furniture from the thrift store. I’m afraid it’s full of critters and creatures. But there was something so beautiful about this chair that I couldn’t turn away. In case you’re wondering, I had found this vintage wingback chair for $60 at Value Village and Unique Thrift here in Maryland, so if you’re ever in the area, you must go. Best prices in town and a great selection. I literally walked away from it, begrudgingly…..only because I hate the thought of lugging upholstered stuff home from the thrift store that can’t get tossed in the washer and dryer. I am afraid that every fabric from the thrift store is infested with some nastiness that I don’t want to bring into my house. Finding a great desk or table is one thing……..finding a chair with lots of nooks and crannies for bugs to hide is another thing. Anyhow, the color of this wingback chair looked pretty, until I removed the cushion. If you were to look up sun-bleached, I do believe you’d see a picture of the wingback chair next to it. That meant one thing: this wingback chair must be reupholstered. I signed up for an upholstery class at G Street Fabrics in Rockville, Maryland and decided to tackle this behemoth of a chair: a $60 wingback chair that sat in my garage for a whopping 4 years. The biggest worry was: how in the world do I start this project?? It looked like such a solid chair, so where did I start ripping and tearing? And how in the world would I get it back together again?? But as I completed sections of it, I posted the videos to my YouTube channel, including a bunch of reupholstering tips that I’d learned along the way! This is what this gorgeous chair looked like before I got started. But remember–the sun did a number on that gorgeous fabric! 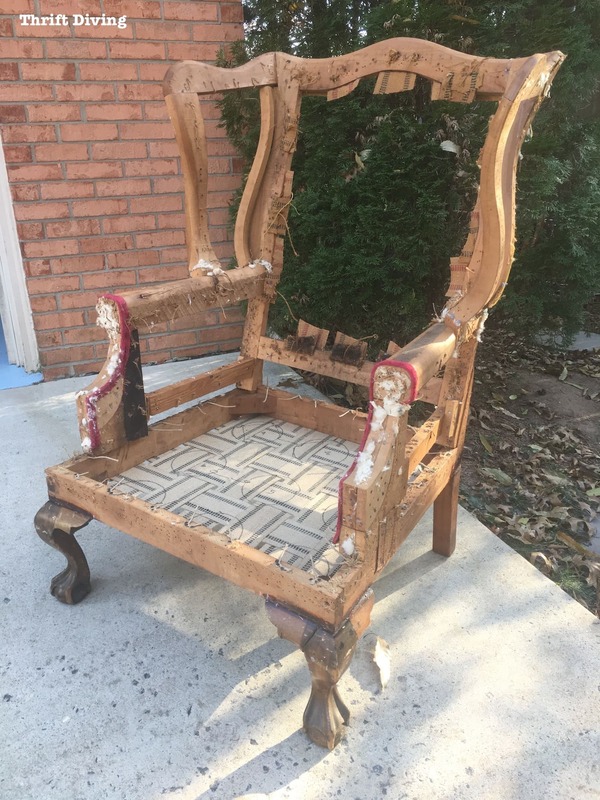 The chair smelled very old and disgusting, like a neglected piece of wonderful that just needed a facelift. 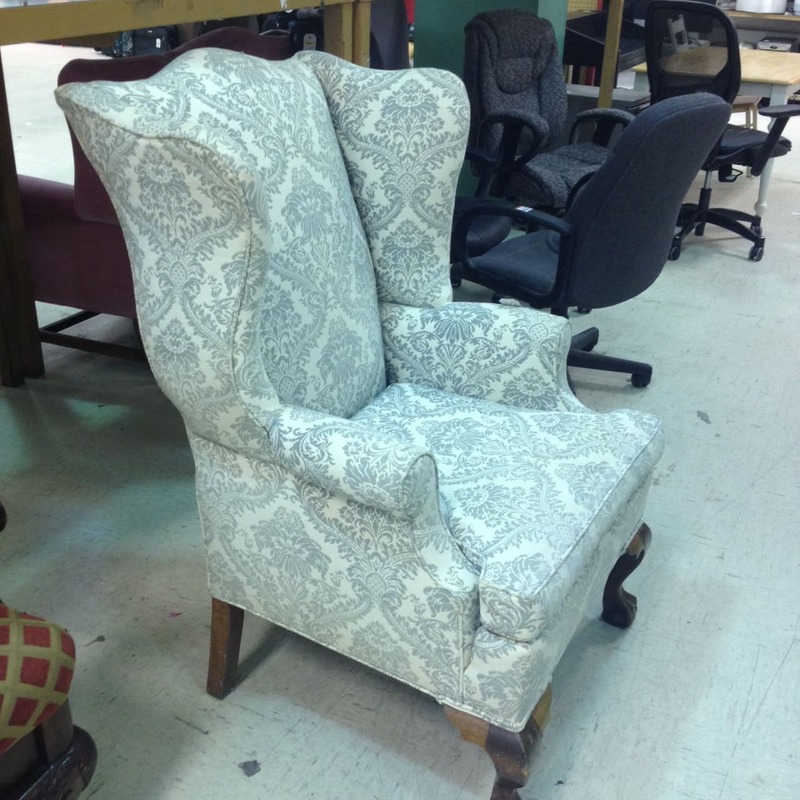 After hours of tentatively tearing down this wingback chair, this reupholstered wingback chair was getting a makeover! The new webbing wasn’t difficult to put in (see PART 3 below) and the rest of the chair needed to be cleaned up. I’ll admit that I totally underestimated the time it would take to finish this chair. I thought 6 sessions of upholstery classes would be enough, but boy was I wrong! This chair was very complex. Every little step felt like a huge win, as well as an impossible mountain to climb! In the end, I signed up for 3 sessions of the 6-week classes (18 classes, give or take depending on my availability). And I still wasn’t done! Because this project was so huge, I have been posting updates to this blog post as I complete it. For now, though, let’s jump right in and see what progress has been made! You can always watch the entire series on my YouTube channel. 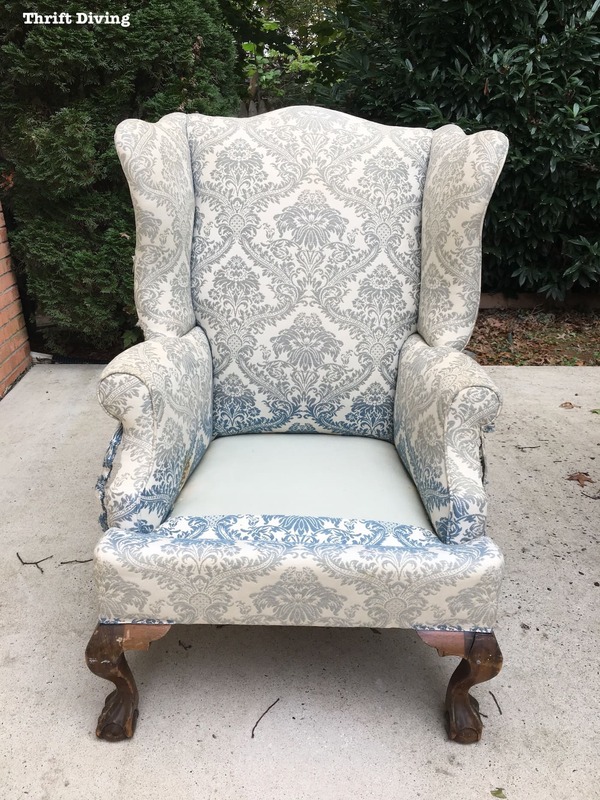 Buying all the materials added to the cost of reupholstering this wingback chair, but if upholstery is a hobby that you plan to do often, then the costs will be spread out over all the projects you’ll work on. About 9-10 yards of fabric. I used this pretty blue velvet from Fabric.com (affiliate link). If you’re freaking out over how many materials are needed to reupholster a wingback chair, you’re right to freak out. It’s a lot. And they’re not cheap materials! That’s why after going through this reupholstery project, I have a new admiration and respect for upholstery. As a DIYer, it makes sense to invest in these tools and materials if you’re planning to do more than one wingback chair. It’s good to build your upholstery toolbox. But if you’re only planning to do one chair, then I would recommend paying a professional. While the cost is expensive, it could be just as expensive and time consuming for you to do it yourself. If you’re like me and you absolutely love the learning process and plan to use the materials again, then go for it! For the amount of money I have spent on classes, fabric, and materials I probably could have bought 3 or 4 brand new wingback chairs from Home Goods. HA! However, I do have to say that neither of those chairs would have been as solid and high-quality as my wingback chair! Anyhow, watch the evolution of this wingback chair makeover below through all the footage I have been filming and posting on my YouTube channel! In this video, go inside with me to my upholstery class and see how to get started with taking a wingback chair apart. This was the scariest part because I had no idea how to get started! Once I started removing pieces, layer by layer, it wasn’t too difficult! Time-consuming, yes…. In this video, I continue to tear down the chair, learning some valuable reupholstery skills along the way. In this video, I finally finished 99% of the tearing down of this chair, followed by attaching the new webbing. I learned how to stretch webbing and how to secure it into place! Also, don’t miss the reveal of the gorgeous fabric I selected for this chair! It took a bit of time to tie down the springs and to tie them together. I have to admit that I was nervous about this part because it looked so complicated! But with a little bit of practice, I did it! See how the seat springs turned out! In this video, you’ll see how I stitched in the coconut fiber to the seat using a double-pointed needle and twine. By this point, all of the burlap pieces should be added to the chair, however, in this case, there is still layer of burlap that is needed to cover the back of the chair, along with stitching down the coconut fiber to the back of the chair. 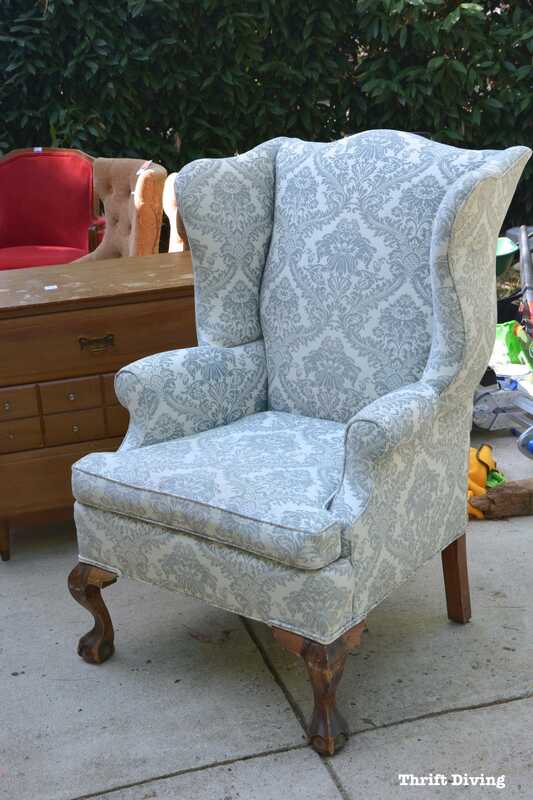 However, for this part of the wingback chair makeover, we could get started on the front of the seat and the arms. Keep watching to see the progress made! In PART 7 of this video series, I show you how the instructor and I finished the seat and the front, and started on upholstering the arms. 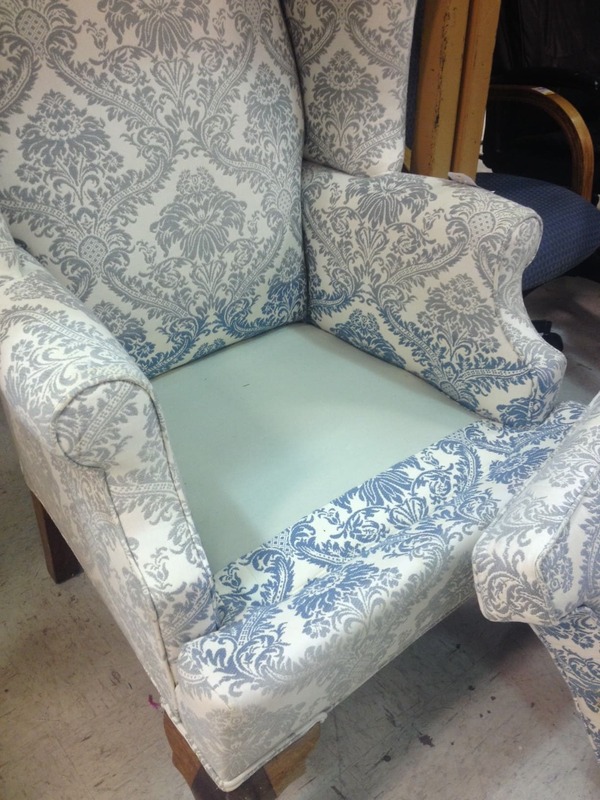 Part 9 of 10 – How to Reupholster a Wingback Chair – Finishing the Back and Outside! For this video, I was all out of upholstery classes so it was up to me to finish off the back and outside of the chair on my own! Although it wasn’t perfect, I think I did a pretty good job! Part 10 of 10 – COMING SOON! « Can You Match Paint Colors? Let’s Review the Nix Mini Color Sensor!